I have a virtual machine running under VirtualBox that needs to be able to get updates from the Internet. Using VirtualBox's normal network interface methods (NAT or Bridging), the guest machines not only have access to the Internet, but also to all the interfaces on the host machine and their networks! Googling around for a solution didn't turn up anything useful, and VirtualBox seems reluctant to provide a Internet only option either. After trying for about a day to mess with various iptables solutions and coming up empty handed, I decided to try a different approach to the problem. My solution is to create another “router” virtual machine and connect the main virtual machine through it to the rest of the network. All network traffic for the guest would go through an “Internal Network” connection to the router VM, and then the router would provide NAT, DHCP, and DNS services for the guests. This solution also has the benefit of providing multiple guest VMs with Internet-Only connections. After installing the Ubuntu 14.04.2 x32 Server (you can use your favorite flavor of non-GUI Linux, your mileage may vary), make sure it is up-to-date (sudo apt-get update and sudo apt-get upgrade on Ubuntu/Debian). It's also probably a good idea to install OpenSSH Server, especially if your virtual machines are headless like mine. Next, it's time to install and configure the routing services. These instructions are based off a really useful blog post over at The Novian Blog. You can set up the WAN interface with a static IP if you'd like, but the LAN interface should be static so that guest VMs can always find it. The addresses for the LAN interface were chosen to be similar to the default NAT configuration provided by VirtualBox. Of course you will want to change the domain to something suitable for your network. Hopefully this will help you create an isolated guest with Internet access in your setup. I've been needing something like this for a while, and now that I've figured it out I felt like I needed to share. If you see anything wrong with this setup, or know how to make it more secure, please feel free to leave a comment. I was getting prepared to start another headless Raspberry Pi project (an IoT gateway) and reached for my old standby command line operating system, Minibian. I grabbed the latest version, copied the image to the memory card, and started setting things up. I ran into a problem when I tried to get the RaLink RT5370-based USB WiFi Adapter working - the kernel seemed to recognize the device, but I just couldn't get it working. After digging through the system logs it became apparent the firmware required by the adapter was not present in Minibian (Only later did I realize that I may have just needed to install a package to get the required firmware). After trying to get the WiFi adapter to work for a few hours, I gave up and switched to Raspbian. I was then able to get everything working (including the WiFi adapter), but was left with a GUI and it's associated bloat that I didn't really need, so I set about seeing what packages could be removed and still leave me with a fully functioning command-line based system. Initially, I just did a search on the web and found a few different posts and conversations that dealt with removing the GUI and combined them to get things slimmed down quit a bit. After that, I started listing the installed packages and removing the ones that looked like they would not be needed. (It was at this point I noticed the firmware-ralink package that I could have probably installed on Minibian to get the WiFi adapter working there – maybe next time). My first stop was a conversation on raspberrypi.stackexchange.com where it was suggested that you could rip out the X window system by the roots by simply removing ''libx11-.*''. That did remove a lot of packages from the system! Other blog posts like this one at Richard's Ramblings added to the list of packages to remove. Finally, I used the dpkg --get-selections | grep -v deinstall command (thanks askubunut.com!) to list all the remaining packages on the Raspberry Pi and removed all the ones that look like I could do without. There were a few times when I removed too much and had to re-install a package or two, but eventually boiled it down to the following commands to convert a normal GUI Raspbian installation to a lean command-line only version (Be sure you don't have any important files or configuration on your system before doing this, and don't blame me if your mission critical Raspberry Pi application gets lost in the process!). A word of caution: One of the uninstalled packages took the /etc/network/interfaces file with it, so before stripping all these packages, you should make a copy somewhere else on the device and then restore it before rebooting your system, or you will have no networking available after rebooting! After all was said and done, I was able to reduce the size of the file system from 2.5GB down to just 800MB. Along with the size savings, there are also fewer programs running and fewer packages that need updating. Not to mention having less software on the system creates a smaller attack area for hackers to leverage. So if you find that you need to remove the GUI from your Pi, hopefully this information will help you with your cleaning task. And of course, if you need something even smaller, there's always Minibian for a really stripped-down configuration. I really have enjoyed playing with the Raspberry Pi, but many of my projects don't require a GUI (for example OpenVPN and web servers). For projects like these, I usually install Minibian which is a great, small version of Raspbian with all the GUI goodness removed. It is a perfect starting point for my headless projects, except that out of the box, it comes setup with locale and timezones configured for Great Britian. This causes some strange characters to come up when typing on the keyboard, and the clock doesn't reflect my local time zone. Fortunately, these issues are easy to address, and I will show you the steps I take to configure my system for my locale and time zone (us-EN & America/Los_Angeles). Just use your locale and time zone in the steps below to configure your system as desired. Install Minibian on your SD card following the provided instructions. 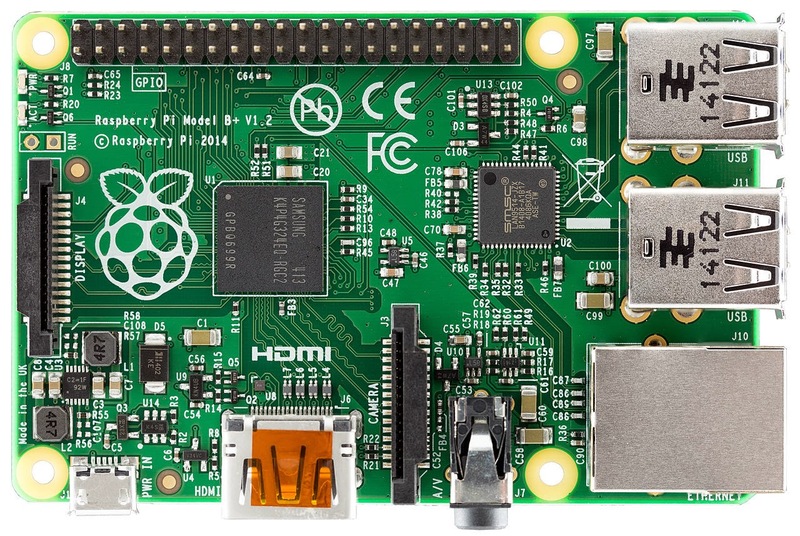 Insert the card into your Raspberry Pi, power it up, and log in. (The default username/password is root/raspberry). You may also want to change the name of your system from the default "raspberrypi" by editing the /etc/hostname file. Set your "Keyboard model" to "Generic 105-key (Intl) PC". Set the "Country of origin for the keyboard" and "Keyboard layout" both to "English (US). Next for the "Key to function as AltGr" choose "The default for the keyboard layout". For "Compose key" I chose "No compose key". Finally, choose "No" for "Use Control+Alt+Backspace to terminate the X server". Once the command completes, reboot your Raspberry Pi to pickup the new keyboard layout. and de-select "en_GB.UTF-8 UTF-8" and select "en_US.UTF-8 UTF-8", then set the default locale to "en_US.UTF-8" on the next screen. then log out and back in again to pick up the new locale. and select "America", then "Los_Angeles" to set the local time zone for your system. then reboot your system again. Now log out of your root session and log in as your new user. 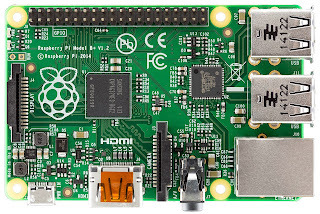 Now you should have a headless Raspberry Pi system that you can use for various server projects that is customized for your locale and timezone! If you have any questions or comments on this procedure, please feel free to leave a comment. While it seems that many people have successfully driven NeoPixel/WS2812 strings directly from the Teensy using a small resister to reduce ringing, I was pretty sure that wouldn't work over any appreciable distance. It also appears that the newer WS2812B pixels won't work at all with just a 3.3V signal. 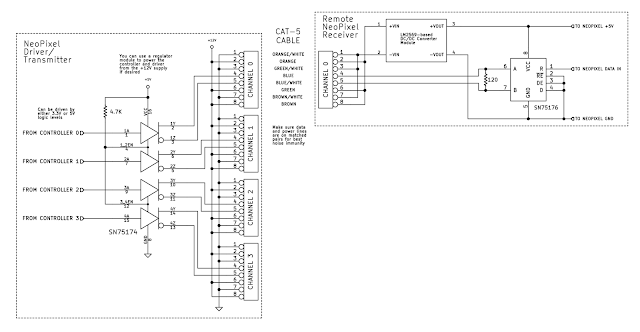 It didn't take me too long to come up with the solution for the data issue - RS-422/485 drivers and receivers! Since the pixel data is really just serial data, I figured using RS-485 balanced transmission lines to send the data would work perfectly. The data signal is well within the bandwidth these chips are capable of, and as a bonus, the SN75174 Quad Differential Line Driver IC inputs will easily accept the 3.3V outputs from the controller! On the receiving end, I went with SN75176 Differential Bus Transciever chips because I had several of those on hand in my parts bin. I just needed the receiver part of the chip, and it was quite easy to disable the transmitter portion. Next up was the power-drop issue. Right about the same time I was dealing with this I discovered these LM2596 DC-DC Buck Converters on Amazon - they were perfect! Their low cost, small size, high efficiency and wide input voltage range made them a snap to integrate into my project. (Just make sure you check/adjust the output voltage on these before you use them!). Now I could feed 12V into my long cables feeding the remote strings, and use these power supplies on the receiving side to drop it down to the needed 5V. Since I was only driving about 30 pixels on each line, the 3A output was more than enough to drive each string. With all the pieces in place, it was time to test out my ideas. First, I wanted to test out driving the data signal using the differential converts, so I wired up a transmitter and receiver on each end of 100 feet of CAT5 cable, connected up my controller to the transmitter and 5 meters (150 pixels) on the receiving end. For now, I just connected up a beefy 5V/10A power supply at the receiving end to power the string. After connecting everything up, it worked like a charm! Every pixel was responding as though it was sitting right next to the controller. Next up, I cut the string up into 5 lengths of 30 pixels each, and wired them up as shown below, using the differential transmitters/receivers and the DC/DC converters (again making sure they were adjusted to provide 5V output! ), powering everything with a large 12V power supply. Everything worked as expected, the pixels were changing colors as commanded, with no color shift or dimming caused by voltage drops. Notice that I am calling out the color codes for the CAT5 wiring - it is important that at least the data wires are on twisted pair of conductors (blue/blue-white in this case). I also like to have the power wires paired as well, with all the +V connections on the solid wires and the -V connections on the white-striped wires, which helps with noise immunity on the power lines. In my project, I used 4 position connectors and just tied all the +V wires together on one terminal and all the -V wires on another (with the data on the remaining two terminals). Using all the extra wires in the cable for power helps reduce the resistance, and thus the power drop on the cables. 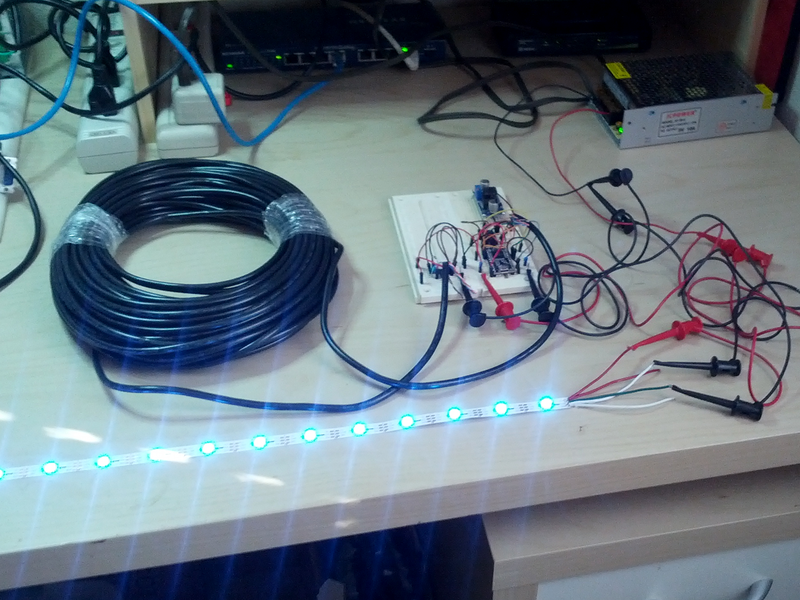 In the end, my project worked well, with the strips connected via 15 - 25 foot lengths of CAT5 cable all connecting back to my central controller. If you have a project where you need to have several remote RGB pixel strips all controlled from a single controller, hopefully by using this approach you can make your pixels work just like they were connected directly to the controller. As usual, your feedback is always appreciated, and if you have any questions please feel free to leave a comment. 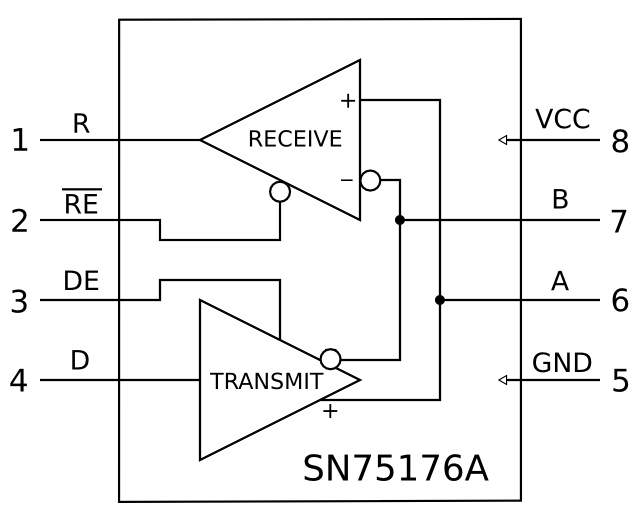 UPDATE: I've just added a new post that goes into more detail about using the SN75176A chip in this design, for those of you who have asked about variations of the above circuit. to set the volume level of sink 1 to the maximum and unmute it. Now I could hear the sound just fine! I fired off a Windows XP x32 guest, and was able to hear sound, but it was very distorted and choppy. The solution to that was to change the sound hardware in the virtual machine's configuration file from <sound model='ac97'> to <sound model='es1370'>. After that, I was getting perfect sound from my virtual machine! Now for a few caveats – it seems that changing any of the PulseAudio configuration or restarting the service while the virtual machine is running can cause problems like the sound no longer working, all the way to the virtual machine's OS hanging up trying to play sounds. So once you started your virtual machine, leave things alone! I have also been working on trying to forward the sound over the network to my workstation, but so far I am having mixed results with that. Hopefully I'll have another post soon describing how to make that work. And here is the usual warning that goes with tweaking your system like this: These instructions worked for me, but your mileage may vary. Also, I won't be responsible if any of this causes your machine to stop working or catch on fire – but this stuff should be pretty straight-forward and not cause any serious issues that can't be reversed. Hopefully my adventure will help you to enjoy hearing from your virtual machines. If you have any questions or corrections, please feel free to post them in the comments. I have several network cameras watching the outside of my home, monitored by ZoneMinder. I have it set up so that when there is motion detected, it will record for several seconds and send me an email with stills of the incident. While this is nice and gives me a little peace-of-mind, I've always thought about having it record continuously. While it is easy enough to do in ZoneMinder, I didn't really want to use up that much storage recording video and then have to scroll through it to find anything interesting. The other day I saw a blog post where someone was using a Raspberry Pi and a webcam to do some time-lapse photography, and that sparked an idea that seemed easy enough to do in an afternoon – I could come up with a Python script to grab images from the network cameras at fixed intervals, and write them to a video file in order to generate a time-lapse video! The first step was to figure out how to build a video file a frame at a time using Python. I had played with the motion-jpeg (mjpeg) format in the past, which pretty much consists of jpeg images streamed one after the other in a file (sometimes with a boundary record between them). I discovered that I could simply capture and append jpeg images to a file and get a video file that could be read by a few video players and converters. Best of all, I could use a simple avconv (formerly ffmpeg) command to convert the mjpeg files to mp4, which is smaller and viewable by almost any player. for Debian-based systems or by using the appropriate package manager for your distro. Notice the URLs supplied in the Camera constructors. These are specific to each brand of camera, but you can usually find the format with a little Googling. In my program above, the first three cameras are Panasonic BL-C101A network cameras, the last two are a D-Link DCS-930L and a TrendNet TV-IP551W which both have very similar software and URLs. The font file referenced above needs to be located in the same directory as the Python script, and for best results should be a mono-space font. I just grabbed the Ubuntu Monospace Bold TrueType font file for use here, but you could use anything you like. echo "Converting files to mp4..."
echo "  Converting $f to $t"
I had a lot of fun learning a few new tricks while working on this, and hopefully you can use it as a starting point for your own time-lapse adventure. If you find this post useful, or have questions about how it works, please leave a comment below.